Monday’s ad is for Michelob, one of the brands created by Anheuser-Busch as a draft-only beer in 1896. It was first packaged in 1961, and its distinctive teardrop bottle won a design award the following year. But that was replaced in 1967 “for efficiency in the production line,” but reverted to a traditional bottle in 2002. 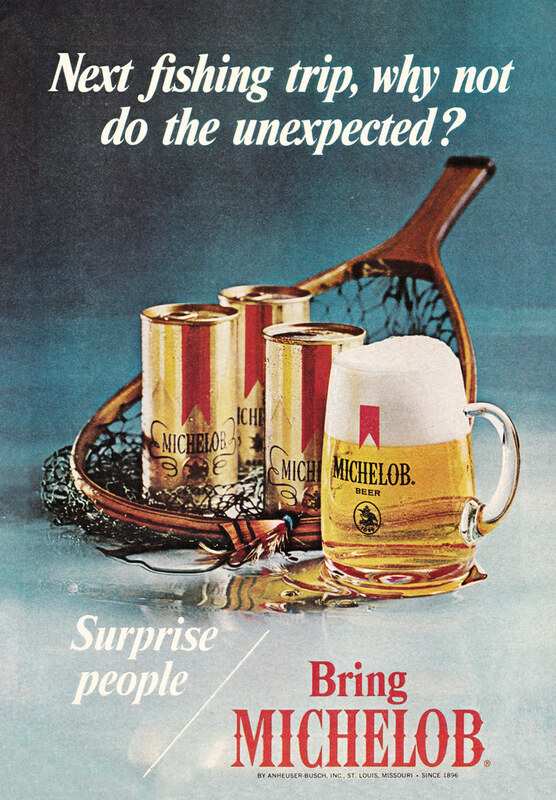 This ad is from 1970, and features three cans of Michelob caught in a fishing net, with one of the beers poured into a mug. I think there’s a lure next to the net, possibly the one used to catch the beer.